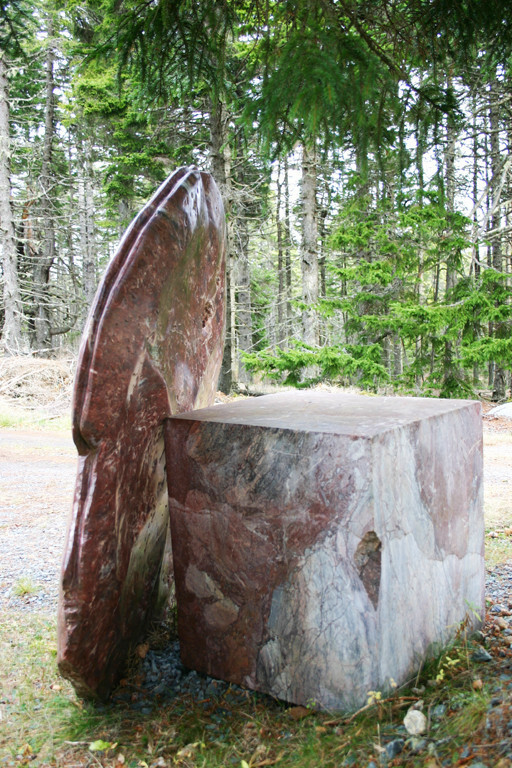 Vanessa Paschakarnis’s “Cape Breton Shield” is about 5 feet high, 4 feet wide and 10” thick and deals with some of the same basic questions of culture and nature and their inseparable existence. 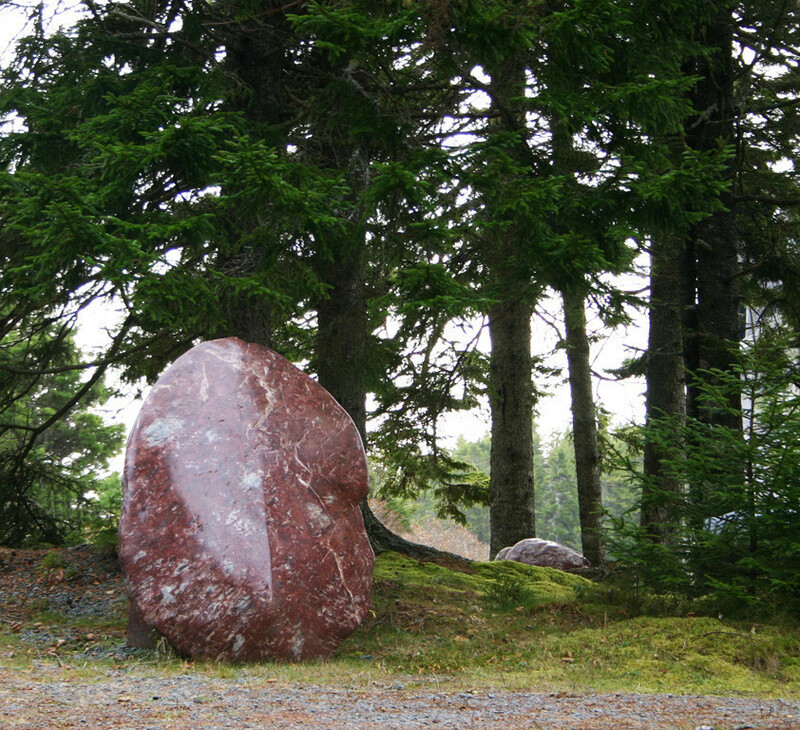 The “Cape Breton Shield” leans upright against a square block of the same marble that it is made from. The position of the shield reflects on our uprightness but intrinsic to the shape is that it has to be held upright. It has to lean against something, which indicates a rest, a balance as well as a potential for relocation. 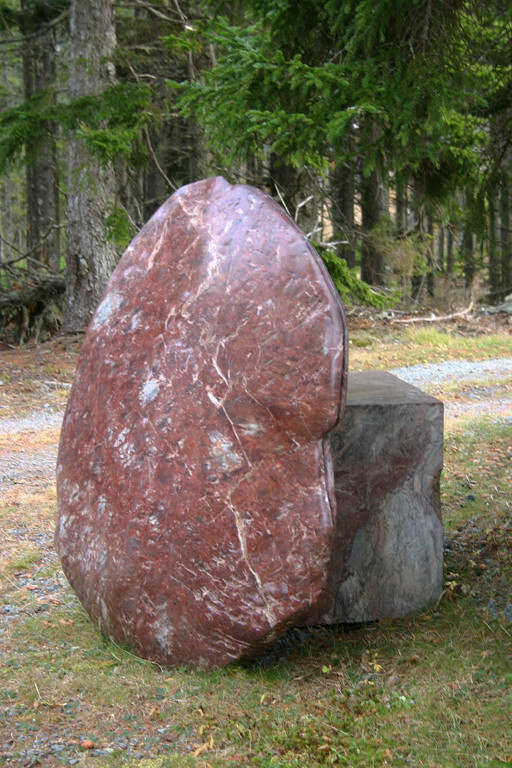 The duality within the piece is that it is large and heavy, yet not meant to be seen in a stable position. The work engages into an encounter with it as a thing that could be a shelter. Responding to our scale it refers to familiar shapes, but does not define any specific thing. The surface of the carving is heavily marked and then finished to a smooth surface so that it seems to be like skin, old skin, weathered skin, scarred and polished. The back and the front are distinctly different in texture. 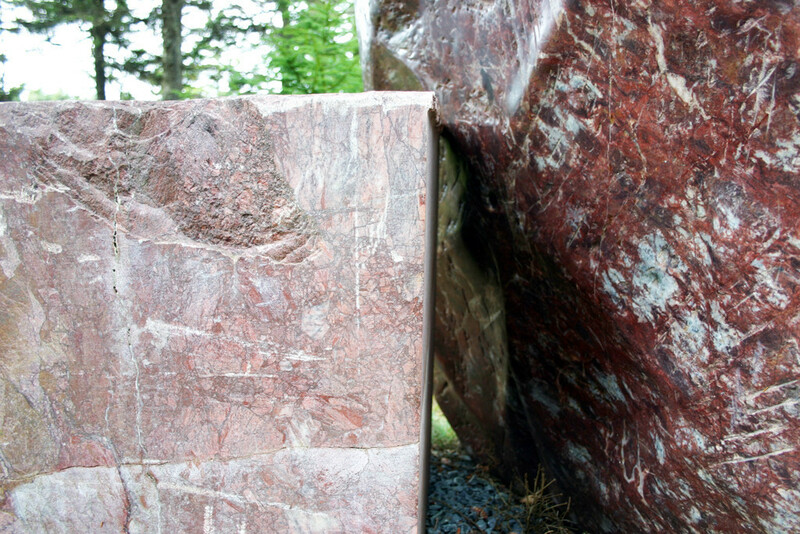 A groove around the edge of the Cape Breton Shield and a finger-size hole in the back suggest an inner presence. 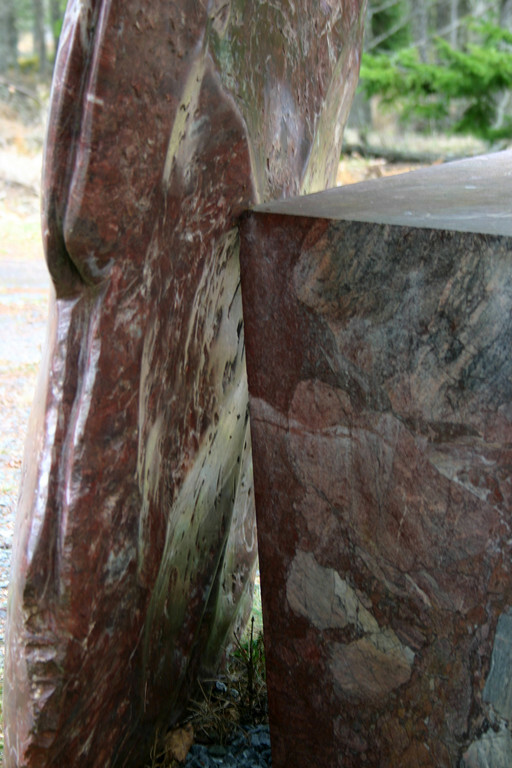 It talks about an unknown component, an inner space defined through the logic of form. This identity of the unknown in an object reflects on our urge of self-definition. 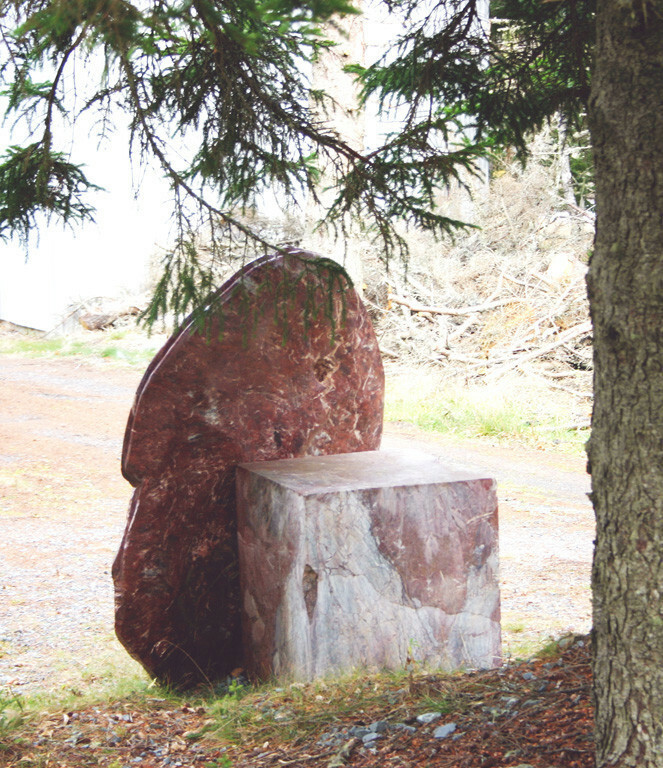 The Cape Breton Shield alludes to the essence of an encounter, an encounter with form as a thing and the thing as equal companion. It reflects on the human desire to interact with our surrounding. It confirms us as beings that are part of the natural world. See also >> Vanessa Paschakarnis at the Frederik Meijer Gardens & Sculpture Park, exhibition curated by Joseph Antenucci Becherer.